I was born in Putney, London in 1942 and the war still raging, memories of which are still clear in my mind; being carried in a baby’s smelly gas mask, hearing a ‘doodlebug’ V1 rocket and the sirens before a bombing raid. The freedom of my childhood with Wandsworth, Putney and Wimbledon Commons, plus Richmond Park to explore, run and cycle round, to swim and fish the lakes and rivers, was an experience children today do not seem to have. So it was, after I had met and married my dear wife, we had to think about where to live. London was too expensive and in the countryside employment was quite difficult to obtain. Eventually, in 1967, we settled for a three-bedroomed semi in Bletchley with the garden overlooking open fields but I would continue to commute to London. That same year it was announced that a new town was to be built called Milton Keynes, linking the towns of Bletchley, Stony Stratford and Wolverton and incorporating another 15 villages and farmland in between. In 1970 I secured a job locally with the Post Office as a telephone engineer. My actual job was on exchange construction which in fact was not building the exchanges but putting the equipment into them, modifying and expanding the system. Telephone exchanges ranged in size from what looked like a brick built shed which had up to a thousand lines and then gradually getting bigger until they occupied several floors with hundreds of thousands of lines. 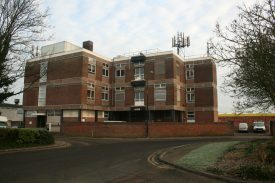 At Leighton Buzzard in the late 1960s and early 1970s, an exchange was built to supply telephone lines for the whole of the town and fitted out with the new equipment but one large area of the exchange was left empty. As time went on this space was gradually filled with equipment which very few people had seen before. When complete it became the first electronic telephone exchange with the older part being used as back-up. We were used to exchanges being very noisy with the constant clicking of the old Strowger equipment and it was strange entering the new electronic exchange where there was so little noise. 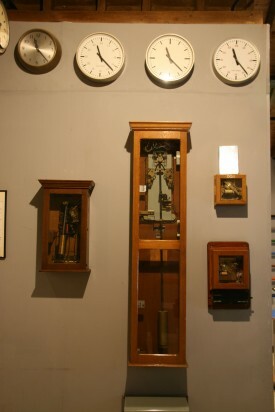 At that time in the Milton Keynes area nearly every village had a small exchange until the equipment was incorporated into the newer larger exchanges and the small exchange buildings were subsequently sold off. On my first day working for Post Office Telephones, after a chat with my new ‘boss’, I was sent to Wicken, north-west of the designated city area. Wicken was a small exchange and I couldn’t believe the confined space in which we had to work, especially when working close to the floor. I was introduced to three other members of staff – the TO (Technical Officer) and two technicians, one of whom became and still is a good friend. I was kitted out with my tools which came in a large smart pigskin bag, with smaller pigskin pouches for delicate adjusting tools. I started to find out what we were actually doing and where the various PO (Post Office) buildings were. Being a Government Department the PO had instructions and specifications for everything from a screwdriver to a building, from a screw to a vehicle – you name it and it had a spec – in fact Post Office specifications seemed more severe than I had found while in the RAF with the MOD specs for the aircraft. I soon found out about the various communications buildings and what was in them. There were the main telephone exchanges situated in towns and cities which ranged from a few thousand to hundreds of thousands of lines and were always expanding. The smallest exchanges, apart from those private ones in businesses, could have up to a thousand lines. Trunk routes were mainly situated along trunk roads where repeater stations were placed every few miles. These boosted the signals to allow clarity of speech over long distances. Fenny Stratford had a repeater station, another was to be found on the Newport Pagnell Road and a third at Hockliffe and so on northwards and southwards along the A5. In the 1960s the Post Office designed and built the Tower in London now known as the BT Tower. On this there were microwave transmitter/receivers mounted and aimed at all parts of the country. The demise of the repeater stations followed soon after. All sorts of odds and ends were found in the repeater stations. In Fenny Stratford our group had a store which had to be cleared. Old cable was burnt and clouds of black smoke wafted across the A5. We found a couple of wind-up clocks dating from George V’s reign and in a big shed next to the main building was a full-size snooker table. The emergency generator in the main building was a large single piston engine which drove an enormous cast flywheel connected to a generator – a beautiful piece of machinery which I thought was going to be installed in Milton Keynes Museum. In the Broughton repeater station we found items which had obviously been put there by the civil defence staff and included metal beds, sheets, blankets, pillows, tinned food and pump fire extinguishers. 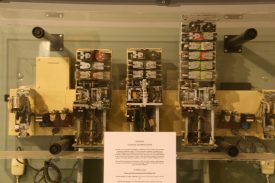 In Newport Pagnell and Bletchley the operator-manned exchanges were still in use – the Bletchley one until the late eighties. 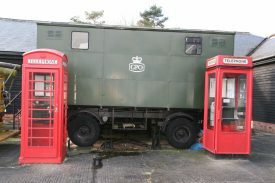 Gradually demand for telephones was outstripping availability so small mobile exchanges were being connected to alleviate the congestion and modern crossbar and electronic exchanges were being developed and exchange buildings enlarged. It became apparent to both the Milton Keynes Development Corporation and Post Office Telephones that with the ever increasing rate of growth in population and development there was an urgent need for a brand new telephone exchange in the geographic centre of the new town. One of the reasons was a need for public transport and according to the Development Corporation a system was needed whereby you could dial for a bus which would then magically appear from around the corner! The PO would have preferred to build a larger modern exchange at some point in the future but because of the pressing need for the dial-a-bus scheme, they agreed to build a temporary exchange near the top of the hill where Fishermead was later built. It was actually called Bradwell Abbey exchange although it was some distance from Bradwell Abbey itself. A large concrete slab was laid and a contractor from Oxford built a big wooden building with six rooms of varying sizes. The contractor was actually a shed builder and he said it was the biggest shed he had ever built! To me it looked more like a bird hide with few windows. It was high on a hill overlooking the valley where Willen Lake was to be built and behind us was miles of pasture land, in fact the countryside in all its glory. There were no roads, just a temporary gravel path leading up from where Marlborough Street was being built. then a crossbar, finally an electronic. With the equipment starting to arrive our thoughts turned to marking the floors for where the various racks of equipment were supposed to go and how much time we had to complete the installation. Other things worried us of course – there was no running water or mains electricity and communication was by a small walkie talkie through to the Bedford main office. Eventually power was supplied by a large mobile generator and water by a bowser, refilled every couple of days. We didn’t worry about communication too much as so many ‘tourists’ turned up to see this phenomenon that hand-written notes and word-of-mouth were the best way of doing things. We were working seven days a week for months with the odd overnight thrown in but we didn’t mind because the surrounding area was so peaceful, the wildlife was plentiful and interesting short walks at lunchtime were a must. We saw hares, partridge, pheasants, sky larks to name just a few. On a couple of weekends we saw guys with their shotguns walking across the fields. Evidently they had been covering the area for years, shooting rabbits for the pot and foxes for the farmer. During the winter months, field mice used to creep into the storage radiators overnight which left a strange cooking smell when the generator was turned on in the morning! One bright summer day, whilst eating our lunch outside, we watched a glider trying to gain height but there was very little up draught from the small hills around us and as we were the only building in sight and with plenty of space to land, the pilot executed a perfect landing. Of course he asked if he could use the phone!! We got in touch with our control in Bedford on the walkie talkie and they in turn contacted the Dunstable flying club. After half an hour or so a small aircraft flew over and a tow rope was thrown down to us. We moved the glider on to a level area near where the small aircraft had landed. The tow was attached and with a bit of stabilisation from us hanging on to the glider’s wings, the aircraft revved up and the glider moved in unison with the plane and off they went. Our group had let go of the wings but momentum had kept us running for a short while until we eventually fell over into two piles of humanity covered in dirt and dust. The pilot and the glider club were duly grateful. By 1975, I had become the Technical Officer, electricity and running water were connected, we had communications and a unique new exchange in Milton Keynes was completed and opened on time for dial-a-bus. An aerial had been erected for MKTV and another huge slab of concrete was laid next to ours – this was for the new electronic exchange which would replace our temporary ‘shed’. Over the next few years as Fishermead and Eaglestone were developed, buildings spring up all around, new sewers were dug, Willen Lake was nearly finished and starting to fill with water and we were still installing various bits of equipment. By 1989 Post Office Telecommunications became British Telecoms. Then almost suddenly, the new ‘silent’ electronic exchange next door was up and running and I, with a new group of guys, was given the job of decommissioning our original exchange. A lot of equipment was scrapped but the best, I believe, was sent to be installed in a country in Africa. The fossils we had regularly dug up or found from around the nearby building sites were given to a grateful Open University. The ‘shed’ was carefully demolished; the high quality wood was given/sold to whoever in BT wanted it. I had some high quality mahogany beams, some of which have been turned into egg cups, bud vases and napkin rings amongst other things, and I am sure there are lots of sheds and fences built from the wood of the old exchange scattered around Milton Keynes. There is no sign of it now. The large, dirty and drab, fawn-coloured building took over – I look back fondly to our friendly shed in the middle of the countryside – I was there right at the beginning and at the end. Thanks for writing this up. My father ran the planning group for PO telephones in Eastern Region and I recall him saying how they were planning new buildings in the knowledge that they were too small to house the current technology. At MK they would need to demolish the old village if they had to install a Strowger exchange. It took ages for the tech to mature though, he first spoke to me over fibre optics fron Martlesham heath in the mid 1970s, though it was years befiore System X would reach the exchanges. MK exchange was challenging nonetheless, IIRC requiring a solid raft because of poor ground conditions. I worked as a Telephonist in the temporary manual exchange (I presume Aylesbury Street, Bletchley), from circa. 1969 to 1970 when I was transferred to Bedford as DQ and faults telephonist. 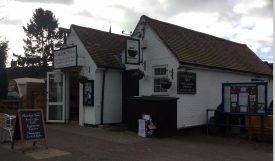 I remember communicating with the telephonists at the Newport Pagnell manual exchange before they closed it down not long after STD was introduced. I and 2 other girls were chosen to ‘model’ on a PO Telecomms float, as part of the Bletchley carnival, accompanied by a model of the new PO (now BT) tower. My dad also lectured at the PO training centres in Bletchley Park and Drayton Parslow. 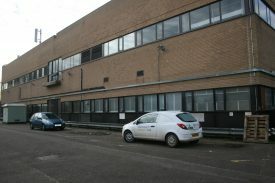 The local operators and Directory Inquiries were actually housed in a building in Tavistock Street, Bletchley. I know because I did the maintenance there for a number of years. Were the operators in the Exchange Fenny Stratford or somewhere in Bletchley? 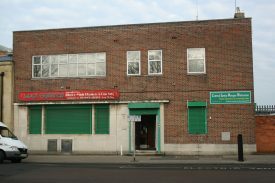 The telephone operators were originally in Aylesbury Street, Fenny Stratford. We have a photo of them on our Talk About Bletchley blog.